MOSCOW — In a sharp rebuff to the West in the diplomatic wrangle over Ukraine, President Vladimir V. Putin said Tuesday that Russia would come to the rescue of its financially troubled neighbor, providing $15 billion in loans and a steep discount on natural gas prices. It was a bold but risky move by Russia, given the political chaos in Kiev, the Ukrainian capital, where thousands of demonstrators remainencamped in Independence Square, protesting their government’s failure to sign political and free-trade accords with Europe. For the moment, however, Mr. Putin seemed to gain the upper hand over Europe and the United States in their contest for Ukraine, a former Soviet republic of 46 million that Russia sees as integral to its economic and security interests. It is by far the region’s most populous and influential country that has remained outside the European orbit. For Mr. Putin, the jousting over Ukraine is the latest of several foreign policy moves that have served to re-establish Russia as a counterweight to Western dominance of world affairs. This year, he defied Washington bygranting temporary asylum to Edward J. Snowden, the former National Security Agency contractor, and deflected an American military strike on his longtime ally, President Bashar al-Assad of Syria, with a proposal to eliminate Syria’s chemical weapons. International financial experts have said those conditions were crucial to ensuring that Ukraine would be able to solve its economic problems and not need another bailout soon. Many of the conditions, however, were politically unappetizing to Mr. Yanukovich, who is expected to seek a second term. 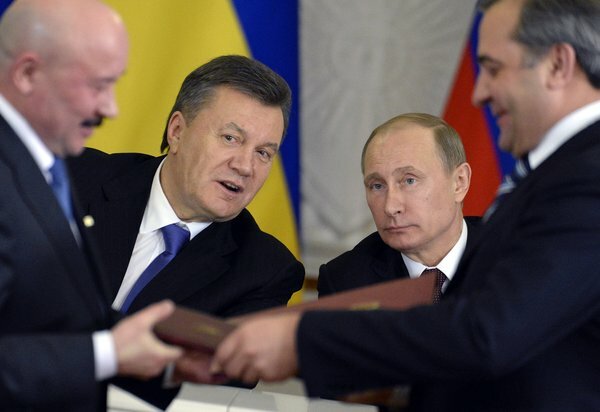 Mr. Yanukovich, whose political fortunes have appeared bleak in recent days, praised Mr. Putin’s leadership. “I know that this work wouldn’t have been done at this optimal speed if not for the Russian president’s political will,” he said. Ukraine has long been caught in the middle of battles between greater powers to the East and West. Mr. Yanukovich has repeatedly sought to play each side against the other, often infuriating both and coming across as an untrustworthy partner. The country has been grappling with a deepening financial crisis that only worsened after Mr. Yanukovich announced abruptly last month that he would not sign political and free-trade agreements that had been in the works for years with the European Union. Mr. Putin said that the money to aid Ukraine would come from Russia’s hefty reserve funds, and that the price of gas sold by Gazprom, the state-controlled energy behemoth, would be dropped to $268.50 per 1,000 cubic meters — less than the $380 Western Europe pays for Russian gas — from between $395 and $410, saving Ukraine $2 billion a year. The Russian leader’s ability to announce a major bailout of Ukraine highlighted the contrasts with the West, where a rescue plan on such a scale would typically require protracted debate and negotiation. In Russia, it was a decision that Mr. Putin, in consultation with a close coterie of aides, could make himself. The decision to help Ukraine, without immediately demanding a commitment to join the customs union or any other evident quid pro quo, secured Russia’s continued sway and positioned Mr. Putin to further chastise Western officials for their aggressive efforts to support antigovernment protesters. Senior Western envoys, including Victoria Nuland, an assistant secretary of state; the German foreign minister, Guido Westerwelle; and Catherine Ashton, the European Union’s foreign policy chief, have all been in Kiev in recent days and expressed support for the demonstrators. They have urged Mr. Yanukovich to listen to their demands and revive talks with Europe. On Sunday, Senator John McCain, the Arizona Republican whose strong views on what he has deemed Russian foreign policy aggression and human rights abuses draw close attention in Moscow, appeared onstage in Independence Square, where he told hundreds of thousands of demonstrators that the United States stood with them. Russia had maneuvered aggressively to derail Ukraine’s accords ahead of a European Union conference in Vilnius, Lithuania, last month, where Mr. Yanukovich was expected to sign them. The Kremlin threatened draconian economic sanctions that could have devastated Ukraine’s already battered economy. Mr. Putin and other senior officials, however, had insisted that they were merely pointing out necessary steps that Russia would take to protect its economic interests. They accused Western powers of interfering in Ukraine’s affairs after refusing to accept that Russia had won by making a persuasive case. The unrest in Ukraine, which was further animated by a violent crackdown by the police on demonstrators on Nov. 30, has been driven largely by a sense of betrayal among protesters who had been assured by Mr. Yanukovich that their country was drawing closer to Europe politically and economically. Mr. Yanukovich has insisted that Ukraine would ultimately move toward Europe and even consider signing the accords at a later date. But a senior European Union official has said those discussions have been cut off.